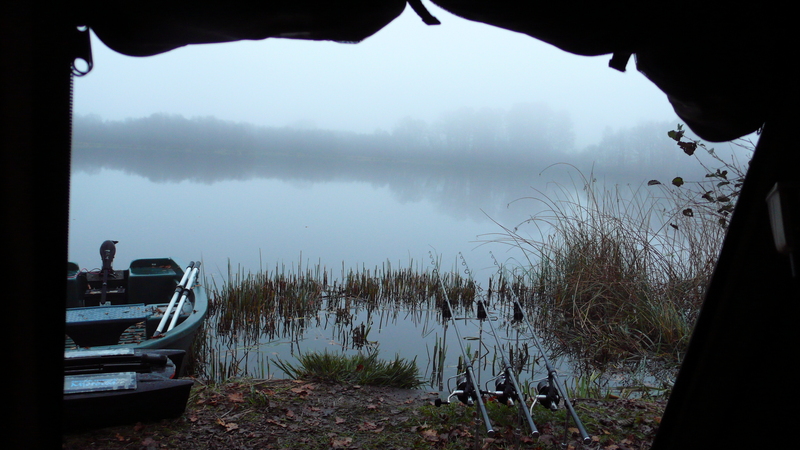 November has always been one of my favourite months of the year when there is almost always a two or three week period where the carp get their heads down and feed heavily just before the really cold winter weather comes in. They seem to be able to sense the seasonal cycles and know that winter is almost upon them. Many people shy away from November as the nights become long and cold, but if you are well prepared with warm clothing then you can have a real result. 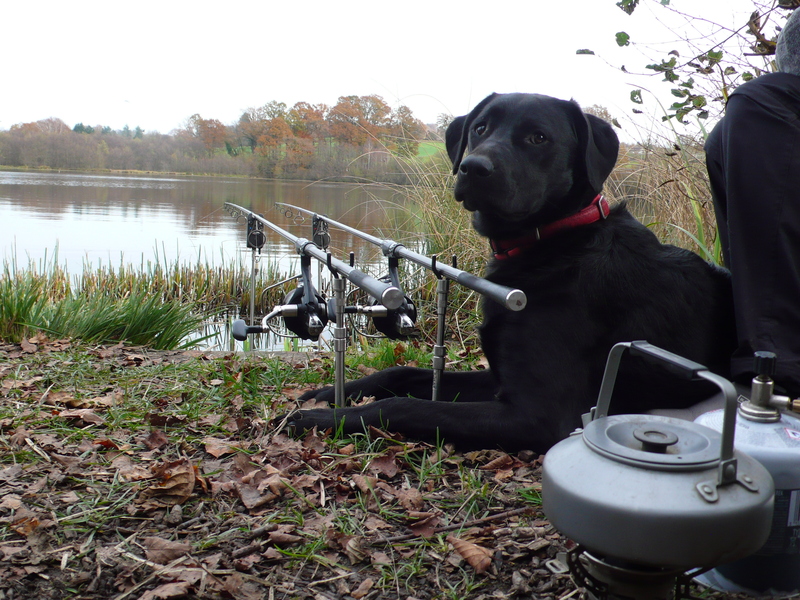 There was nobody booked on Lac Serreire the last week of November 2014, so I decided to make the most of it and fish the week. The week before had been a little tricky for the lads fishing, but the angler in the Woods swim had enjoyed quite a hit of fish. For the last few days of the week before, the fish had shown quite a bit in the area half way between the Woods Swim and the Shallows Swim, pretty well directly out in front of the Outflow Swim but at very long range. Also, the lily pads in the outflow corner hadn’t been fished for a while and every evening the odd carp had showed right in the pads. So I decided to fish the Outflow Swim to be able to cover the two areas where there had been recent shows. On the Saturday afternoon one rod was placed about 3 feet off the outflow lily pads and about half way along their front edge. The pads were now dying off for the winter and these dying back weedy areas are often very attractive to carp in the colder water conditions. The line was marked with pole elastic and lined up with a tree on the far bank horizon to enable an easy re-cast in the night if necessary by using the spool clip. This rod was locked up solid on single bank sticks, pointed at the spot, the clutch set tight and the Delkim on super sensitive to ensure at least a few beeps if a fish was hooked. In this situation a hooked fish usually boils up on the surface and the tight locked up setup causes it to kite left or right and not directly into the pads. The other two rods where placed at about 170 yards to the area approximately half way between the Woods and Shallows swims, almost directly in front of the Outflow swim and spaced about 30 yards apart. For these rods I initially took the rigs out and dropped them from a rowing boat then marked both lines with pole elastic. I decided not to use the boat for the rest of the session. In the shallow water I didn’t want to spook the fish with use of a boat during the week. Features on the far bank tree line were picked as markers and then a bait boat was used for the rest of the week. One interesting point was that I found that where the fish had been showing, there was a covering of silk weed over almost the entire area. I have always found this a great weed to fish in and on Serreire it always seems to contain a lot of snails so maybe this is why the carp seem to like it. Presenting baits in silk weed is no problem as it is only stringy and ‘gloopy’ when removed from the water. It doesn’t reduce the effectiveness of rigs fished in it unless it is very thick and on Serreire it is only ever a thin layer. Rigs were the same on all three rods; 2oz (50gm) leads fished on MCF lead-clips, tungsten tubing behind the lead on the mainline, 5″ (12.5cm) coated braid hook lengths with the last 1cm of coating stripped to allow the hook to turn easily. I prefer longer hairs than average because I think that hook and bait separation helps with initial hooking. Hairs for this session were about 3cm to the top of the boilie. I fished straight forward bottom baits on all the rigs. Based on the fizzing and clouds of mud being produced where the fish had showed the last few weeks, they seemed to be feeding in the silt a lot and not really on top of it. So I decided that pop-ups might be simply missed or not act naturally enough to be taken. I have also often found that at this time of year, when they have been hammered on pop-ups, critically balanced baits, etc. if you do something different and give them bottom baits right on or in the surface layers of the silt, where they are used to feeding, then they often take them readily. During the week, the wind increased a lot and heavier leads were finally needed to stop the undertow from moving the leads fished at distance. One point that I believe to be really important in silty conditions is to not move the lead at all once it has hit the bottom after casting or dropping from a bait boat. If the lead is moved then it very often pulls the hook link behind it into the silt and also the hook point can very easily become masked causing the rig to become much less effective. I also like the extra bolt effect of having the lead at least slightly plugged into the silt. Bait was fresh fishmeal boilies with very low flavour levels and I decided to initially put out about 5kg in a line between the two long range rods, with the hook baits at each end of the line. I have long believed that lines of bait are excellent for stopping groups of fish and also hook baits placed at the ends of the line are much better than in the middle. For the rod on the lily pads in the outflow corner, about a kilo of bait was spread inside the pads and out to the edge where the rig was placed. During the week, I continuously baited the pads little and often with about a kilo a day using a catapult. The long range spots were baited with the bait boat with about half a kilo every time a rig was dropped. The reason for the very low flavour levels is that I am a firm believer that it is a good quality base mix that catches the carp and not the flavour. On commercial fisheries, where the carp see so many highly flavoured baits, low level flavours in highly nutritional quality base mixes are nearly always much more successful. The left rod on the pads produced fish from the off whereas the long range spots took a couple of days to really get going. I think the pads nearly always hold fish as they are such an attractive feature for the fish, so a quick result is often possible. The long range open-water spots take a little time to get going but can be built up through the week so long as the bait is applied steadily and it is something that they like enough to start to really search for. I think hitting the same spots every time when using a bait boat is also quite important. Towards the end of the week the pads rod was repositioned out to the long range spot because so many fish were showing out there. The week was really successful with 49 fish landed making it a November to remember.